Dietary fiber and potassium are nutrients required by the human body to maintain optimal health. Fiber comes from the parts of plant foods that are not digested by enzymes in the intestines. Instead, fiber adds bulk to the stool, and helps move solid waste easily from the body. Potassium helps conduct electricity in the body, plays a role in skeletal and muscle function, and maintains heart and lung function. Many foods contain one nutrient or the other, but only a few are rich in both fiber and potassium. Fruits, vegetables and a few legumes and grains are the best sources of the two nutrients in single foods. Many different fruits contain rich amounts of both fiber and potassium. A medium banana, for example, contains about 3.1g total fiber, according to MayoClinic.com, and approximately 480mg potassium. Other fruits high in both of theses essential nutrients include oranges, raspberries, pears, apples, strawberries, figs, raisins, apricots and tomatoes. One medium-sized tomato contains about 292mg potassium, and 1.5g fiber. Fruits eaten with their skins, where possible, generally provide more fiber than peeled fruits. The richest sources of potassium in the diet are fruits and vegetables, according to the Linus Pauling Institute at Oregon State University. Many vegetables also contribute largely to the intake of dietary fiber. One medium potato, baked with its skin, provides about 2.9g fiber and approximately 926mg potassium. Other vegetables that contain significant amounts of both fiber and potassium include artichokes, winter squash, acorn squash, peas, broccoli and sweet potatoes. As with fruits, unpeeled vegetables also provide more fiber than those with skin removed. A few nuts and seeds, including almonds and sunflower seeds, are rich sources of fiber and potassium. Almonds contain about 3.3g fiber, according to the Colorado State University Extension, and about 200mg potassium in each 1-oz. serving. 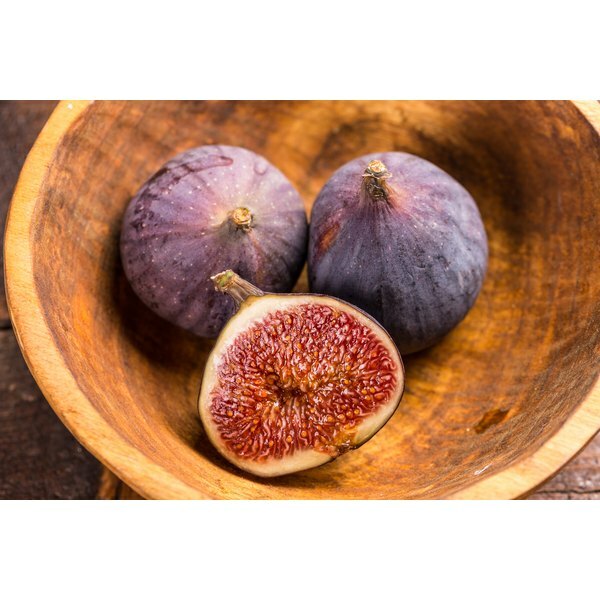 Although meat and dairy products are often rich in potassium, these foods do not contain fiber. Other foods that supply both nutrients include lima beans and soybean products, such as veggie burgers. Some whole grains, such as buckwheat flour, pearled barley and oat bran also provide potassium and fiber. Raw oat bran, for example, contains about 530mg potassium and 14g fiber in each 1-cup serving.